Bon Iver’s 2007 debut, For Emma, Forever Ago was an album of unveiled emotions, made almost legendary by the painful circumstances of its creation, yet incapable of escaping them. 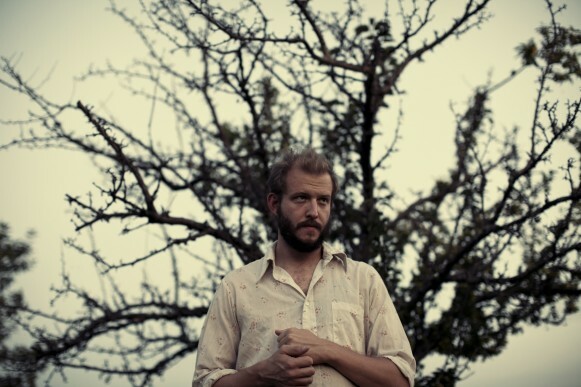 Its folksy, crackling tones are powerfully moving but irrevocably bound to the heartbreak that Justin Vernon felt while recording the album in a cabin, holed up deep in the snowy Wisconsin woods, having lost his girlfriend, his band, and his health. If you’ve followed indie music at all for the past few years, you’ve heard the full tale, so I won’t repeat the details. Suffice it to say, no matter what For Emma, Forever Ago meant to you personally (and it meant a lot to a lot of people), it’s impossible to listen to it and not feel Vernon’s sadness and bare bones desperation to survive his own personal winter. Nearly four years in the making, Bon Iver, Bon Iver has the feel of a long-awaited springtime thaw, an album with a broader, more colorful emotional palette that proves neither personal crisis nor a compelling back story is essential to making a record that resonates. Musically, it’s more adventurous than its predecessor (with electric guitar, drums and synthesizers, Bon Iver actually sound like a band here) but just as accessible because of its taut songwriting and approachable melodies. The album’s lyrical inspirations are far more ambiguous — almost maddeningly so at times — which makes interpreting and internalizing their meanings a private, subjective exercise. Bon Iver, Bon Iver still generates intense emotions, but the experience is very personal; like a mirror, these songs reflect what you bring to them. It takes less than a minute for the album to take Bon Iver in surprising new directions. On opener “Perth,” a yearning guitar hook surges forth with a warm, electric rush, sounding fuller and more ecstatic than anything else in the band’s catalog to date. Bon Iver’s been hailed as indie rock royalty ever since For Emma, Forever Ago, but on “Perth” they truly sound like it, blanketing Vernon’s sweet croon with a Doug Martsch-style guitar riff and martial drumming that wouldn’t sound out of place in an Explosions in the Sky song. The Australian city was reportedly a place of new beginnings for Bon Iver when they toured, and on this track the band is sonically reborn. It’s pretty exhilarating and one of BI, BI’s best moments. Follow up “Minnesota, WI” feels more pensive, but no less adventurous. There’s a bevy of fluttering woodwinds, banjo plucking, fuzzed-out bass notes, and Vernon singing (surprisingly) in a lower register. His high, trembling falsetto is one of the most immediately recognizable voices in music, so it’s a welcome surprise to hear Vernon reel things back and let the music take the spotlight. By the song’s end, he’s back in his upper range, but the point’s been made; in just two songs, Bon Iver has unveiled more diverse arrangements and sonic experimentation than all of their previous work combined. It isn’t until the third track, “Holocene,” that the band returns to the kind of straightforward acoustic simplicity that adorned For Emma, Forever Ago. The song is an exercise in modesty and unadorned beauty, with a delicate finger-picking pattern and soft horns draped around Vernon’s uplifting claim: “I could see for miles, miles, miles.” Yet “Holocene” also contains the Vernon’s most devastating lyric: “And at once I knew/ I was not magnificent.” Although the exact nature of the Vernon’s discovery remains a secret, it is the terrible clarity of his confession to which one can relate. We’ve all had moments of weakness, those times when we, or the sum of our efforts, were less than we would have liked. Listening to Vernon acknowledge his failures, it’s hard not to consider your own. The rest of Bon Iver, Bon Iver is equally evocative but more difficult to decode. “Michicant” might be a boy’s recollection of losing his virginity, rendered strikingly tender by a hushed guitar and bicycle bell chime. “Calgary” could be about a lover, or nature, or even God. Frankly, it’s just hard to tell. The album’s twisting lyric sheet rarely lends itself to literal translation, instead relying just as much on how the words sound (an old Bob Dylan trick) than what they mean. There are odd grammatical structures, fragmented imagery, and unexpected metaphors that remain a mystery even after repeated listens. Depending on your mood, it can be fascinating or frustrating to try and decipher lines like: “Settle past a patience where wishes and your will are spilling pictures.” and “For the love, comes the burning young/ From the liver, sweating through your tongue/Well, you’re standing on my sternum don’t you climb down darling.” It’s almost as if Vernon is speaking in a made-up vernacular, and couldn’t give a damn whether you understand him or not. But given that Vernon reportedly took over a year to write some of these lyrics and posted them all online before the album was released, they’re clearly not throwaways; they merely require a different level of introspection. One literary school of thought while reading poetry is that not every poem is written to impart a single, intended meaning; sometimes, the reader can only extract the poem’s essence by referencing his own personal experiences. It is up to us to listen, sift through, and mold the meaning of the author’s words from the stuff of our lives. Bon Iver, Bon Iver is much like this; the album’s sparkling sound and the graceful, yet pained quality of Vernon’s voice make it fertile ground for emotional catharsis, but you’ll have to bring your own stories to this record — Vernon is keeping his under lock and key. Impressively, the album is anchored by perhaps its two best songs. At first listen, “Calgary” sounds as understated as any lead single you’ll hear all year, but layers of keyboards, propulsive drums, biting guitar peals, and a slinky bass line slowly lock into place like scaffolding and allow the song to build to a quietly amazing climax. It’s the little details that stick in your head after weeks of listening — the way the instruments unexpectedly come together and the song suddenly blossoms, then gently folds back in on itself. When Vernon finishes with “Oh the demons come, they can subside,” there’s a sense of deep, resounding peace. And then there’s “Beth/Rest.” This song reaches for such absurd heights that by all means it shouldn’t work, but somehow the band pulls it off. Even on an album with lush studio atmospherics and intricately diverse instrumentation, it’s an impossibly over the top, WTF moment for an indie folk band. The unabashed Chariots of Fire-style synth chords, buttery smooth saxophone, and hair-metal guitar balladry would drag a lesser effort into the sixth circle of soft-rock hell (inhabited by the neutered 80’s incarnation of Chicago, the schmaltz-stained theme song to St. Elmo’s Fire and Vernon favorite Bruce Hornsby), but under Vernon’s guidance it sounds magnificently uplifting. It’s easily the strongest melody on the album. “Your love is known, I’m standing up on it, aren’t we married?” Vernon asks, then later exclaims: “This is us!” It’s uncertain to whom he’s singing — a lover, a friend, a creative partner, or even the audience — but the sentiment is decidedly triumphant, especially when you know the depths of isolation to which Vernon once plumed. There are beautiful moments when the confusing events and emotions in our lives come into sharp focus because we’ve heard something played in precisely the right melody, cadence, and intonation. It’s part of the inherent power of music. In spite of its elusive lyrics, Bon Iver, Bon Iver offers a chance at this sort of epiphany, and that’s more than most records can say. For all its gloss, there’s a genuine earnestness permeating this album. Each of the ten songs are named after places, and a promotional t-shirt for the record bears the phrase “Greetings from Bon Iver, Bon Iver,” as if the album itself were some sort of fictitious location you’d like to visit. In many ways, it is. This album has a transportive quality, carrying you to a uniquely mesmerizing space that, like a foreign country, requires full immersion to comprehend the language and landscape. 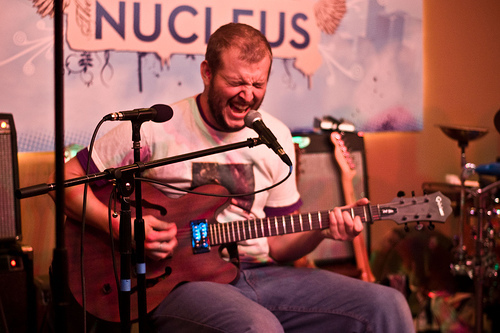 While at times you wish it were more direct, Bon Iver, Bon Iver never feels insincere. Bring baggage (the emotional kind), and stay awhile. Buy Bon Iver, Bon Iver on Amazon. I love Bon Iver and Grizzly Bear! I will check this album out for sure. Nice write-up, thanks. When I read this, then saw a friend’s Facebook mention of this band until now unknown to me, I had to get the album. Which I did. I’ll listen a few times, then return to read your take again. Good review. It’s an excellent album, having listened to the streaming audio of it many times. Makes me want to want to buy the CD despite lack of space in my apt. You’ve captured its essence well. I’ve subscribed to your blog. I really like the review. but i must admit. I’m still baffled by how gracious reviewers are being with vernon’s lyrics. I mean, sure, tangential impressionistic lyrics have their place. But vernon literally does not give a rein to hold onto with these ones. It makes Dylan’s poetry seem downright accessible. I’m afraid it really taints what could be a great album. While reviewing this record, I wrestled mightily with this issue too. Upon the very first listen, the sound and melodies on this album sounded so good I was immediately struck by them. But you can imagine my surprise when I came to realize (after several listens) that he was speaking in almost his own language, and all of this potentially emotive music suddenly had very little say to me. It really bothered me — most great albums grow on you but this one actually shrunk a bit . But after hearing how much work he said he put into the lyrics, I came to a conclusion (and acceptance) that Vernon is writing “poetry for himself” (as Destroyer’s Dan Bejar puts it) — I still wish he had been more literal with his lyrics because this album could have been an absolute stunner if the audience had something more to connect to. But if nothing else, it encourages me that Vernon still has that amazing album in him, waiting to be made. Your comment and that of the person who responded to it are well taken. For me the opaqueness of the lyrics is not really an issue because I have always focused mostly on a song’s melody, tune, instrumentation, etc. That’s why there are few songs i can sing by heart and I really have no idea what most songs are about, although I used to frequently read a lyric sheet back when I bought CDs. 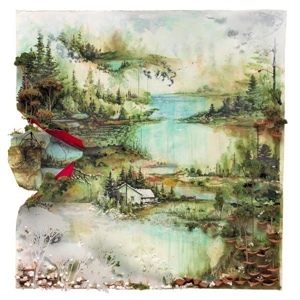 But long story short, to me the Bon Iver, Bon Iver album is just like any other I have listened to. I had read reviews saying the lyrics made little sense but hadn’t really noticed any difference with other songs. Some would argue that my lack of knowing what a song is saying is a loss for me, and I certainly feel less of a fan at rock concerts when everyone else is singing along to songs, but I have never felt that way. maorka, I totally get what your saying. I have friends who are avid music-lovers who don’t find the lyrics to be all that important, because their focus goes immediately to melody, harmony, musical innovation etc. Thus, they can really love bands like Sigur Ros, Bon Iver etc. For me, however, my mind has always immediately gone to lyrics, and my favourite musicians are those who concentrate on putting together well-thought out, well-expressed lyrics. Thus, Sufjan Stevens, Iron and Wine, Joanna Newsom, etc. have always been the type of bands I identify with the most. That said, I’ve been dutifully sliding Bon Iver into my car stereo over the past couple weeks, and am starting to love the songs. I find I have to turn off the poetry-loving English Major part of my brain and pretend the lyrics are just another instrument, selected for sound quality, not meaning. d-sauce. That’s what’s so great about music and the diversity of tastes. We are all different and appreciate (or fail to) things in unique ways. Not that I can’t sometimes be a music snob when friends fail to appreciate the same things I do (or become fans of the latest pop sensations). When my Spotify subscription is accepted – wish you didn’t have to wait for an invitation – I will definitely check out some of the unfamiliar artists you refer to. This entry was posted on June 21, 2011 by Jeff Goodwin in Reviews, Uncategorized.